Arab scholarship played an important part in the European Renaissance, with a major contribution coming from the ninth century polymath al-Kindī whose erudition encompassed philosophy, mathematics, physics and music. Much of al-Kindī's scholarship is enshrined in contemporary sciences such as cryptography; but one of his more intriguing theses remains unaccepted, namely that all objects and beings emanate radiations that affect all other beings. Such an idea is difficult for contemporary minds conditioned by post-Enligtennment science to accept, until it is realised that there are scientifically proven examples of the inanimate affecting the sentient; just one example being the remarkable homing instinct of cats which is thought to be the result of electromagnetic radiation. Al-Kindī's thesis may also explain one of my more bizarre theories, namely that CDs with graphically compelling sleeve artwork sound better that those with mediocre graphics - a theory that also explains why graphic free MP3 files fail to provide the same satisfying musical experience as their CD counterparts. A convincing example of my al-Kindī theory has been spending a lot of time in my CD player recently. Danish label Da Capo has been aggregating their acclaimed Nielsen recordings into budget priced 'The Masterworks' boxes, and Volume 2 contains the complete chamber and instrumental works on six CDs. This includes Nielsen's four string quartets, his violin sonatas and wind works, all in recent recordings by outstanding young Danish musicians. These are complemented by older (1981 vintage) but excellent sounding accounts of the piano works by Hermann D. Koppel who, as a young man, played for the composer. 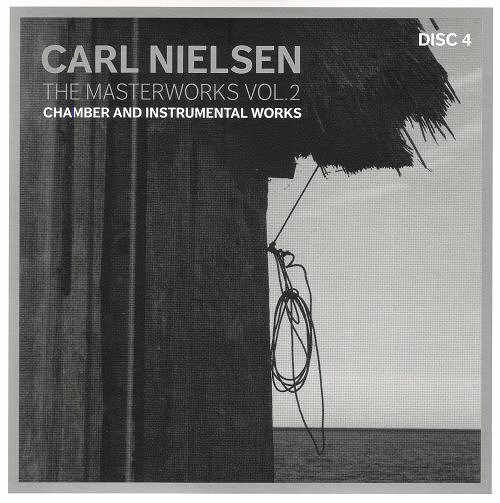 Nielsen's chamber music is an important part of his oeuvre that is puzzlingly overlooked, and, if the truth be told, this new re-release with its UK pricing of less than £30 would be worth buying if packaged in brown paper bags, which happily it is not. 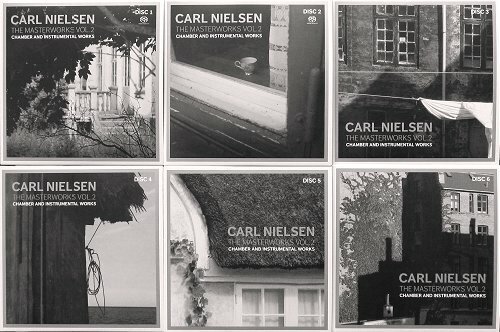 In fact the six CDs come in exquisite card sleeves, each with excellent atmospheric monochrome photo evoking the island of Funen where Nielsen grew up, and the same graphic treatment is also applied to the excellent booklet and outer box - see accompanying illustrations. Naxos, which distributes Da Capo, could learn a thing or two from this packaging, as the bigger label has a knack of presenting great sounding low budget recordings in graphically mediocre low budget sleeves. One canard that needs to be exposed is that CDs are a redundant and therefore irrelevant format; in fact the ratio of CD albums sales to downloads is still more than 3 to 1 in favour of physical discs. And although no information is available on format preferences for that elusive new classical market, it could just be that CDs, with their reassuring graphics and explanatory notes, appeal more to the all important 'classical virgins'. 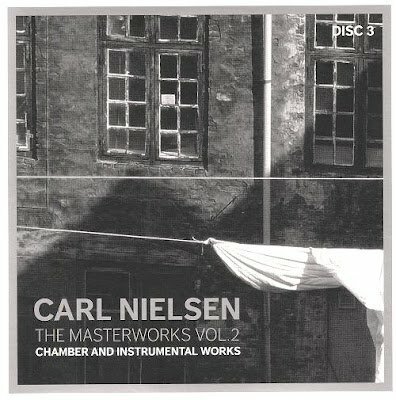 Someone at Amazon clearly subscribes to my al-Kindī theory as the CD set of Nielsen chamber works is priced at £27.54 whereas the MP3 download is £38.99. My theory that sleeve artwork affects CD sound may be outlandish, but it is supported by contemporary science via Bell's theorem - see my posts 'Classical music as synchronicitous soup' and 'Awakening the inner analogue'. While back in the Arab world, al-Kindī's work on music theory included studying the sonic properties of the oud, and in recognition of this erudition Julien Weiss named his classical Syrian ensemble after him. In the US the difference is even greater, MP3 downloads, $45.49 - six CD set $14.74. I hope Dacapo is making something out of my transaction! Dacapo gets substantial subsidy from the Danish state, which allows nice things like original graphic design. Naxos is usually working without such financial assistance. Fair comment Christopher. But surely it doesn't cost any more to create imaginative cheap artwork than unimaginative cheap artwork? The Naxos Delius Mass of Life linked to in my post is a case in point - a yawn inducing library image. A Naxos recording which, incidentally, received financial assistance from the Delius Trust and the Michael Marks Charitable Trust. Another example of al-Kindī is that you can absorb some of the contents of books without reading them, by irradiation, if you are surrounded by many of them. Naxos have no taste. Before artwork, there's typography, which is even cheaper. Isn't this related to one of Norman Lebrecht's theories around the demise of the album in his "Maestros, Masterpieces and Madness" - namely that CDs became commonplace, cheap and replaceable rather than fetishized and irreplaceable vinyl? The cultural value of material things (the physical album) means so much more than the actual "intellectual property". It's the same with art and novels and plays - we struggle to understand what "good art" is, nervously offering our own opinions. Our own opinions are meangingless because value is culturally produced. With physical artefacts it's easier - if it has an expensively produced spine, exquisitively illustrated and embossed in gold then it clearly looks and feels as if it is "good" (almsot regardless of the content). Some people call just call it snobbery. I would argue that this is what gives classical music its reputation.